Kaweco fountain pens have been on the market for more than 100 years, and the company has stayed true to the classic design of its earlier models. I've heard a lot about that AL Sport and Sport models, but it wasn't until I stumbled upon a few pictures of the mint version of the Kaweco Skyline Sport fountain pen that I knew I had to have one. My giant man hands could easily crush the Kaweco Skyline Sport. The subtle mint color of this Kaweco Skyline Sport reminds me of classic cars from the 50's and 60's. This pen looks like it was plucked from history, and the look is reinforced by the crisp chrome Kaweco body logo and circular cap logo. It's hard to capture in a photo, but the mint color of the Kaweco is subtle. The Kaweco Sport lines consist of various pens and pencils that are designed to fit in the pocket. I knew that the fountain pen would be small, but I wasn't prepared for just how tiny it is. Mint Kaweco Skyline Sport compared to the Lamy Safari. The Kaweco Skyline Sport is meant to be posted, for all but those with the tiniest of mouse hands. The pen cap is threaded, which ensures that the pen will stay securely capped and leak free while jingling around in a pocket or bag. The pen posts securely, without twisting or moving, thanks to the grip provided by the notched end of the pen body. 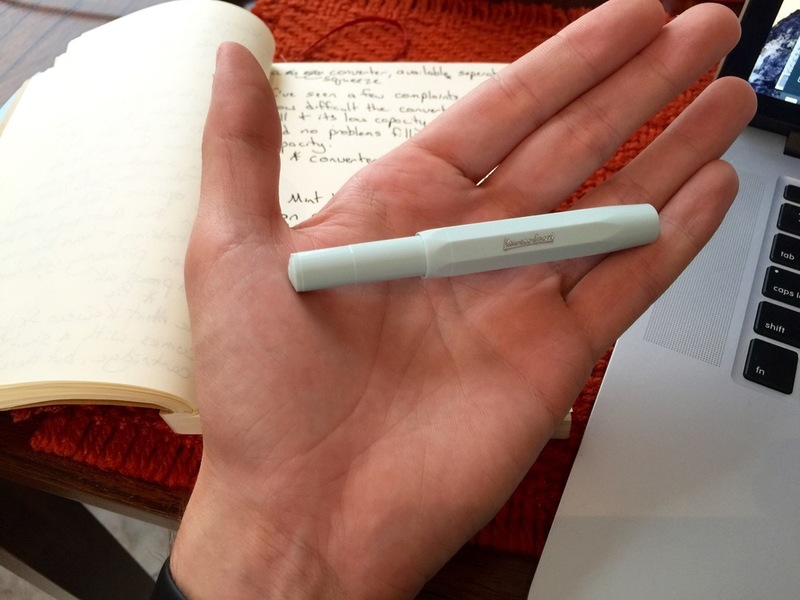 Although the pen is tiny, it nestles comfortably in the web between my thumb and index finger when posted. It's worth reiterating that I have massive hands, so I was surprised by just how comfortable the pen is, given its size. The pen grip is on the thin side, and I do notice some hand fatigue after long writing sessions. The Mint Kaweco Skyline Sport is the first non-Lamy pen that I've owned, and the intricate designs etched in the nib blow the Lamy Safari nibs right out of the water. I went with the fine nib version of the Kaweco, and it is on par with the Lamy nibs, in terms of line thickness and flow. The nib is a silky smooth writer, even more so than the fine Lamy nibs. I'm using Noodler's Bulletproof ink with my Kaweco, and I love the contrast between the black ink and the mint pen body. This version of the Kaweco Skyline Sport comes with a Blue International Short Cartridge, but I picked up a squeeze converter as well, sold separately. I've seen a few complaints about how difficult the converter is to fill, but I haven't had any issues with filling it to capacity. It does take a few squeezes and taps to work out the air, but I am pleased with its performance. The Mint Kaweco Skyline Sport fountain pen is an excellent pocket fountain pen, but it's also an excellent fountain pen period. It fits easily into my pocket, without fear of leaks. I find myself using this pen as my daily writer due to its looks and solid performance. At less than $30 for pen and converter, this pen is an instabuy. For those looking for a heavier alternative, Kaweco also makes a metal version of the pen, the AL Sport. While I have my eyes on the stonewash edition of the AL line, the Skyline Sport is easily my best looking and performing fountain pen so far. This pint-sized pen packs a punch.